09/29 – Initial release based on CM source and not SGT7 because it’s discontinued. This build is almost the same as the official CM build. In my build, I’ve removed some CM stuffs that I considered unnecessary or bloats. My build comes with TWRP v2.8.0.0. You can use CWM v6.0.5.1 by putting the file altboot.img from Nook Tablet Boot Files.zip onto your bootable SDCard and boot into SDC ALTBOOT. Save battery by manually turning off Wi-Fi using the “Power Control Widget” before turning off the screen. Report bugs below. 10/01 – Repo synced, fixed reboot into recovery bootloop. Nook HD+ is my main tablet and so I spent more time working on it. I spent the last couple of days getting the Nook Tablet running. It was straightforward. The kernel on the Nook Tablet is not great. I have play with it a little, but it is sufficient for now. The device still has bad battery with Wi-Fi on during sleep. Wi-Fi will not connect on wake if you do not keep Wi-Fi on during sleep. You can still turn Wi-Fi off then on to connect. This is partly because Google dropped the TI WPA supplicant support. You also get unknown mac address in status. Not all is bad because there are solutions. KitKat is snappier than Jellybean. You will not see Tablet UI and you cannot switch mount point by editing build.prop. Screen record is not working on OMAP devices yet. Here are some recommendations for the device. I recommend turning off Wi-Fi (swipe down from Status bar and select Wi-Fi tile from the Quick Settings panel) before you put the device to sleep and turning on Double-tap to sleep (Settings>Interface>Status bar> Double-tap to sleep, status bar is the top bar) or “go to sleep” tile. If you do not like booting into landscape lock-screen then turn on Rotate lock screen (Settings>Display>Rotation>Rotate lock screen). 01/01 – Initial build, repo synced, kernel 3.0.101, TWRP 2.6.3.0, don’t expect settings from SGT7 cm-10.2, & expect bugs. 01/14 – Repo synced, fixed TWRP battery stat reset bug, 0xD34D‘s screen recorder (Settings>Display>Screen Recorder, hold Power+Vol Up, can record mic), battery status text option for status bar, fixed storage permission bug and other bugs. Might need to clear cache and fix permission. 01/16 – Repo synced, change boot animation size, set zram to 128MB, switch to WPA_SUPPLICANT_TI to fix unknown MAC Address, battery status text option for status bar. 02/07 – Repo synced, revert boot to landscape, fixed unknown serial number, new Cyanoboot, added Advanced storage settings (Settings>Storage>Menu, This allows you to swap storage paths). For SDCARD ROM, new Cyanoboot and boot files will now be included. 04/25 – Repo synced, rework kernel. 06/03 – Repo synced, fix mic not working, fix screen recording not working when pressing buttons Power + Vol Up by remapping it to Vol Up + Vol Down because Screencast got mapped to Power + Vol Up. The Nookie Developers have done a fantastic job keeping this device up to date with current android. 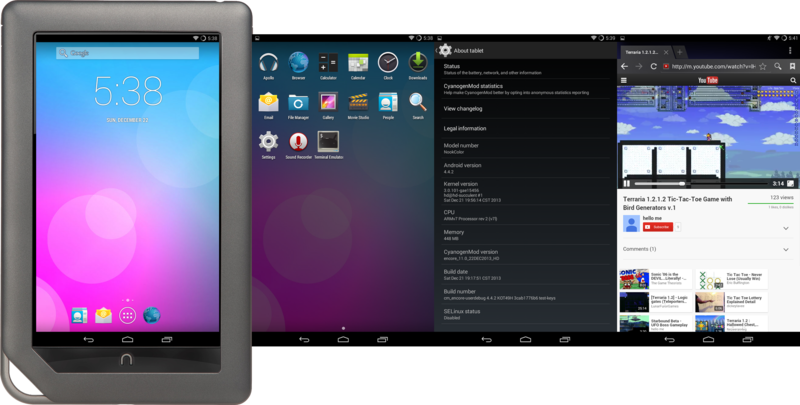 For most devices as old as the Nook Color, their life support is very short because developers like to move on to the next device. Nook Color is special because it is one of the first cheap unlocked tablets. It is great that this tablet lasted this long. 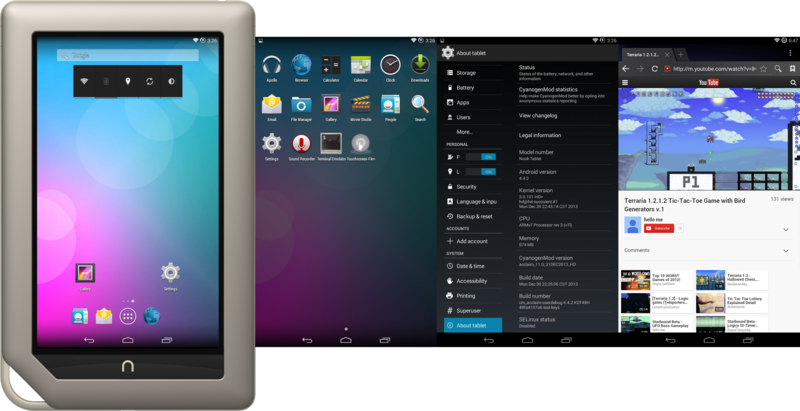 If you do not like or do not know how to compile your own cm-11.0 for the Nook Color, I will provide the one I had compiled. All credits goes to the Nookie Developers. I did not add anything but compile cm-11.0 from the provided sources. Not everyone is capable of compiling Cyanogenmod for his or her device. I did not always compile my own ROM. Back when Nook Color was release, I was using someone else’s CM7 ROM until I had learned to compile my own ROM. It takes me a lot of time to learn how to compile Android and understanding all the different errors that associated with compiling Android. I have seen many different errors over the years. It is one of the painful things about compiling android. I know how to fix the errors, but people new to compiling Android might not. I do not discourage people from compiling their own ROM, but I understand that not everyone is capable of compiling Android. My compiled ROM is not always the best but I try to make it as best as I can. 01/03 – Repo synced, option for double-tap status bar to sleep, for more look at review.cyanogenmod.org. 01/16 – Repo synced, change boot animation size, set zram to 128MB, switch to WPA_SUPPLICANT_TI to fix unknown MAC Address, battery status text option for status bar. I tested ART out on the Nook Color and it work. You do not need to disable boot animation on this build. Enabling ART will make your NC takes forever to boot into Android. The optimizing process takes forever as well if you have GAPPS installed. I did not notice any speed boost with ART. 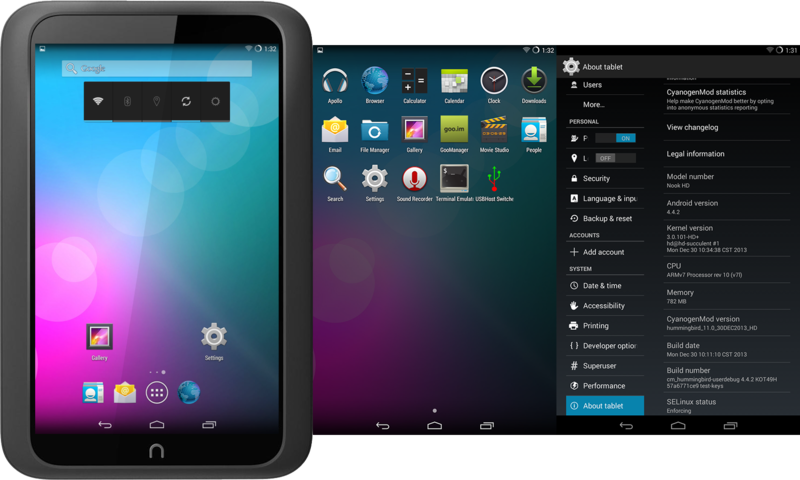 01/29 – Repo synced, enabled KSM by default, revert boot to landscape, new Cyanoboot menu look, some clean ups. 01/31 – Repo synced, fixed reboot to recovery, added Advanced storage settings (Settings>Storage>Menu, This allows you to swap storage paths). I have some suggestions to help you get this going. I have both the 8gb and 16gb NTs working just fine. You say you are copying the “boot.img” to the CM9 rom zip. If you are talking about “cm9.img” that file goes into the sdcard partition. First partition, make it 1001 mb. (Or 2001, 3001, etc.) I have expanded this to 16001 on a 32gb, and found by trial and error that this seems to be the largest that it will accept. What I have found is that not all microSD cards are same. 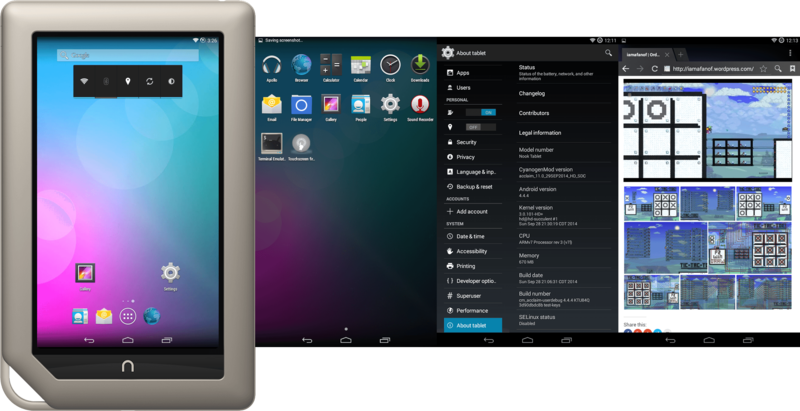 Some cards can be used to boot the Nook tablet and some cannot. I also have a Raspberry Pi, and the same is true there. (If it works in the Pi, it works in the Nook). So, if the card doesn’t work, try another. I don’t know what makes the difference, but I have a SanDisk 8 GB, and that doesn’t boot. When redoing the card between tries, delete all partitions and create a Fat32 partition and then erase it before creating your partitions to use. Instead of “system1” name the partition “system”. This helps with the Gapps file later on. Since the initlogo is turn off in the kernel (I think, haven’t check), there is a delay black screen instead of the regular two android logos screen before the quick CM10 logo screen. Brightness settings now work along with many other changes to the graphics. Chris haven’t updated the boot animation to CM10/Jellybean so it’s still using CM9. There is some freezings in the boot animation, but it’s normal. Copy boot.img/altboot.img, recovery.img, and flashing_boot.img along with u-boot.bin and MLO on to your sdcard. Replace the updater-script inside the rom, *.zip, by drag and drop using winrar/winzip. Flash the rom using recovery. More details are in my other posts. Replace the updater-script inside gapps, *.zip, by drag and drop using winrar/winzip. Flash the gapps using recovery. Do this at your own risk!